I’d been looking forward to my short one-night trip to San Diego for quite a while. Not just because of the beautiful weather, gorgeous nature, or the conference I attended, but because of Trilogy Sanctuary. 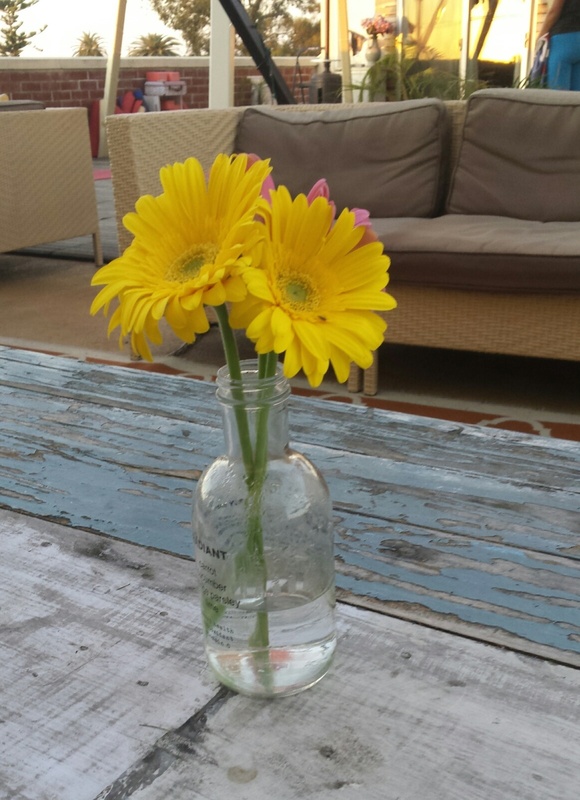 Trilogy Sanctuary is a rooftop oasis of magic. It’s a yoga studio, spiritual guidance center, and cafe. They offer outdoor aerial yoga, which sounds so epic. I’m bummed that I didn’t have time to attend a class this time. As amazing as the space itself is, the gem here is the little cafe in the back. 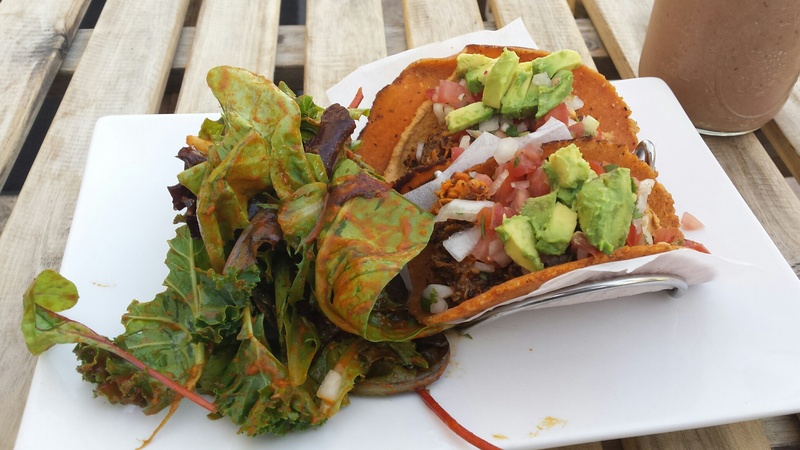 The menu is 100% vegan, gluten free and soy free with raw options (what?! Amazing, right?) and features salads, a bunch of different tasty entrees, desserts and smoothies. For dinner I tried the Passion smoothie and Two Perfect Tacos. 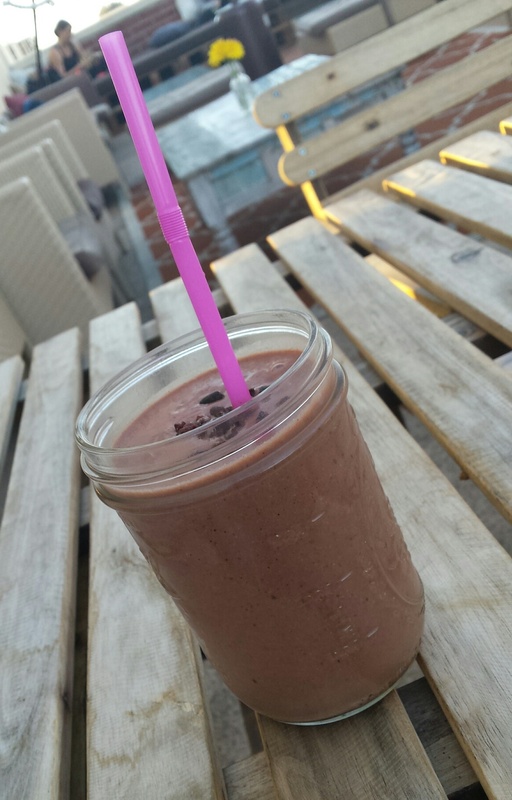 The smoothie was an ambrosial concoction of hemp milk, dates, cacao nibs, raspberries, coconut butter, and protein. It was light, not too sweet, and still felt incredibly decadent. They weren’t lying when they said the tacos were Perfect. They come with house-made tortillas that were hearty, unique, and super yummy especially considering they were made sans gluten. The fixings include quinoa chorizo (yum! ), roasted sweet potatoes, eggplant bacon, avocado, pico de gallo and a spicy almond sauce. I really loved these bad boys. So balanced and with the perfect amount of heat. As an added bonus, the little side salad that I usually find a burden to eat at most restaurants wasn’t an afterthought. It came with a super tasty, smoky chipotle style dressing. Yum. My one critique would be that they went a bit heavy on the dressing for me, but no biggie. At this point in the meal I was stuffed. 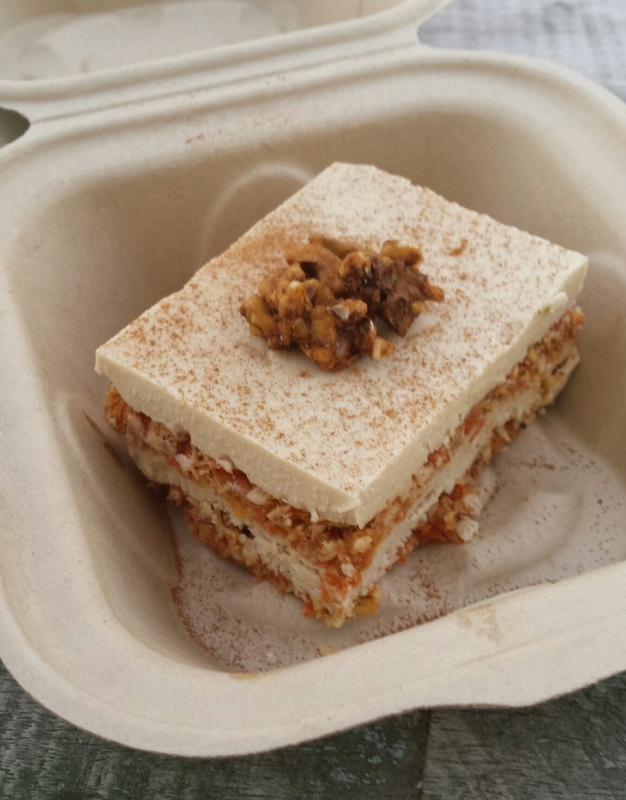 But there was no way I was going to pass up dessert, so I grabbed their raw carrot cake to go. I went back to the hotel, took a swim in the pool, and attacked that bad boy with a glass of cheap wine a few hours later. It was so. damn. good. Not too sweet, nice citrus notes. Easily the best vegan-soy-free-gluten-free-raw dessert I’ve had, and I’ve had a respectable number in my time. I could say that dinner was so good that I had to come back for breakfast, but the truth is that was my plan all along. I arrived a few minutes after I thought they opened at 8am. Turns out they actually begin serving at 9am – whoops! Luckily, they were so gracious that they offered to serve me anyway. So sweet. 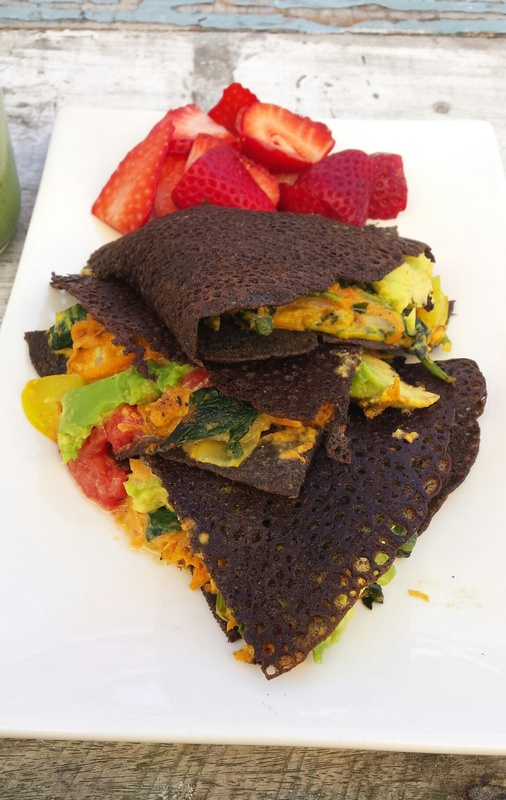 For breakfast I had the Love smoothie (almond milk, coconut water, banana, kale, protein, coconut butter, dates, spirulina and vanilla) and the Savory Crepe with sweet potato hash, spinach, cheesy sauce, avocado and heirloom tomato. The Love smoothie was just as satisfying as the previous one, and I liked the lil chewy chunks of dates and coconut. The buckwheat crepe was awesome, and I actually enjoyed the cheesy sauce which is a bit surprising (I don’t enjoy melted dairy cheese and I HATE Daiya. I know, I know, I’m a freak). I loved the side of fresh strawberries which offered a nice juxtaposition to the super rich crepe. It would be rad if the crepe had a bit more protein, but overall, very unique, fresh, and filling.